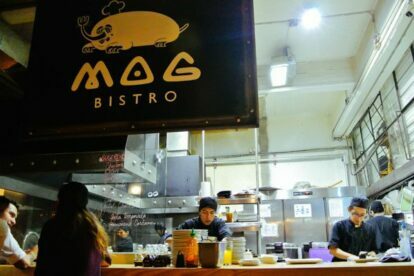 Mog Bistro has everything I like: amazing food, cool relaxed ambient and great prices. It used to be located in a little property on Alvaro Obregon avenue but in early 2016 it was moved to a larger place on Frontera street (a few blocks from its original location). Now it is more comfortable and spacious, and there is no need to wait for hours to get a table like in the previous spot. The menu is huge with Japanese, Vietnamese and Malaysian dishes, and that can be a little overwhelming because everything looks amazing and you may suddenly be struck by an option paralysis attack. You can always find Asian ex-pats eating at Mog, so that’s a sign that the food is pretty good. I don’t know how they do it, but the fish is amazingly fresh and all the ingredients are perfectly cooked. My favourite dishes are pad thai, spicy maguro don (rice bowl with raw tuna, avocado and spicy sauce), red miso soup with clams and the soft-shell crab roll. Also, you can’t go wrong with anything from the sushi bar.